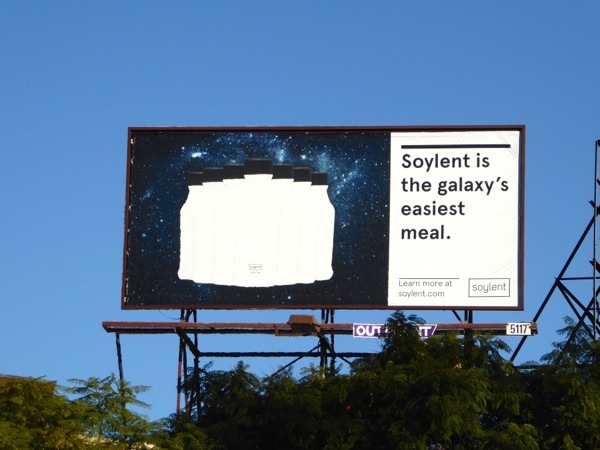 There's something ever so slightly futuristic about a meal that comes in a bottle, so it's no wonder that Soylent chose an out-of-this-world theme when they launched their product in the city skyline. 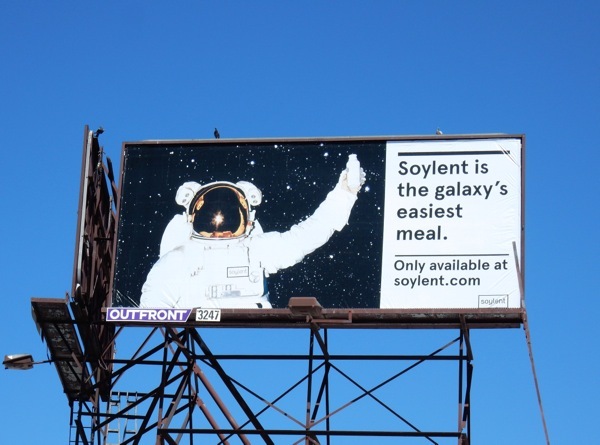 Sci-fi fans will also likely remember the 1973 dystopian movie Soylent Green, where the food supplement ration featured was actually made from human remains to help solve the world's over population problems, which you'll agree is a rather grisly association to have. Let's hope this product isn't made in the same way (no matter how complete it may be). 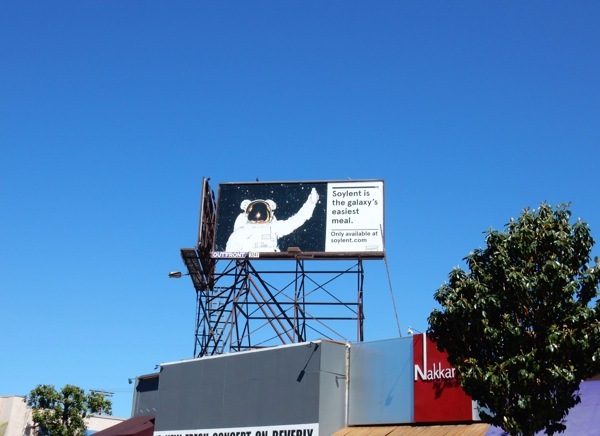 The bottle silhouette ad creative was first snapped above West Hollywood's Santa Monica Boulevard on January 26 (around the same time the astronaut version started to appear), whilst the 'Juice is sweet' billboard was spotted at the intersection of Highland and Melrose Avenues on April 12 and the astronaut billboard was photographed above Beverly Boulevard on April 17, 2016. 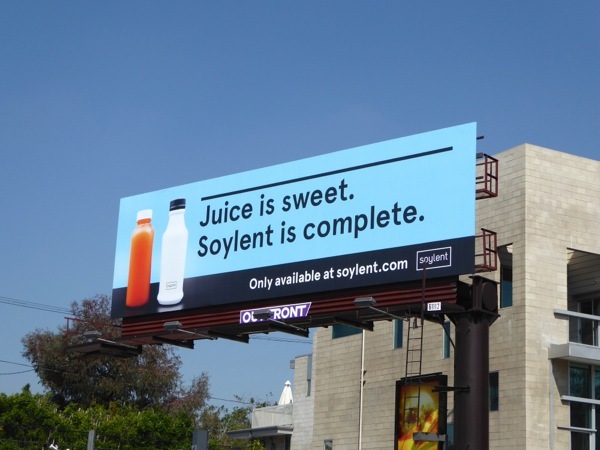 These days it's becoming increasingly hard to know what is and isn't good for you. It wasn't that long ago that a glass of orange juice was considered one of your five-a-day fruit and veg recommendation, but nowadays health aficionados say there's too much sugar, regardless of whether it's natural or not. 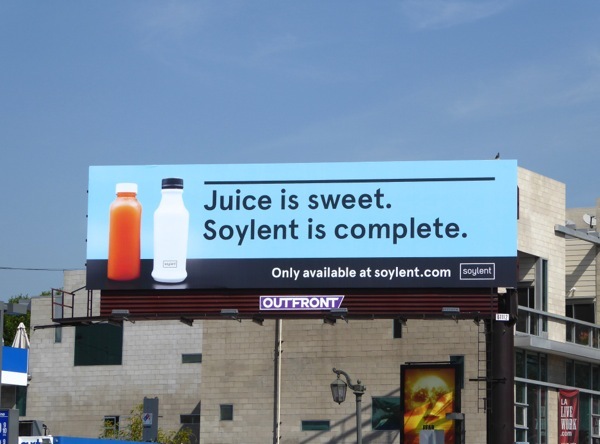 If we're eating and drinking Soylent now, who nows what we'll be consuming in the future. 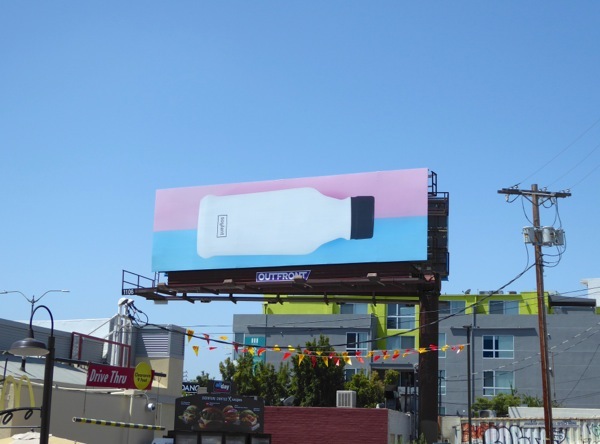 UPDATED: Soylent's marketing campaign seems a little schizophrenic and is back in the skies with yet another set of new ad creatives. 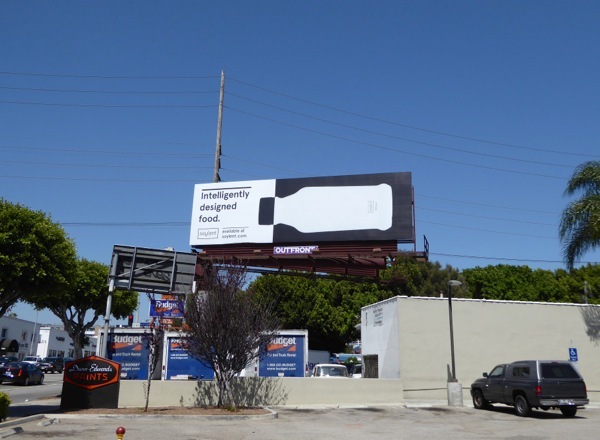 These simple, yet boldly designed ad examples were spied along Santa Monica Boulevard towards the westside on July 11, 2016.